Somehow I managed to get this layout done this afternoon! My little one was giving me quite a run for my money while I was working on it. lol She was having just a little bit too much fun with my scrapping goodies and figured out how to open the little containers that have all of my eyelets in them. Plus, it's just hard to work with a little one beside you, getting into everything your trying to use, and moving things on you when you're not looking! But, I persisted and look what I did! 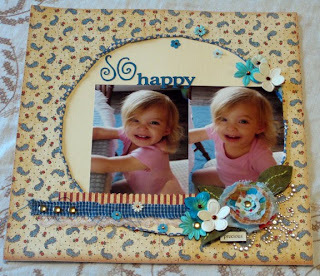 I finished the challenge at Practical Scrappers to use office supplies on your layout or card. 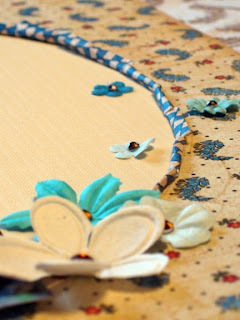 I chose brads and used them to hold down the fabric and lace and also as centers to a couple of the flowers. I did some surfing around last night in some of the scrapping galleries and I was definately influenced by the current trend of tearing and rolling the edges of the paper to create frames and shapes. I used a big bowl to help me make the circle and a small, wooden kabob skewer to help me roll the edges of the paper and curl it. 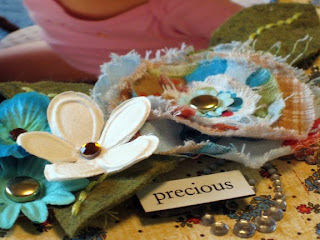 I also made the fabric flower from some of my fabric scraps. I frayed the edges with a razor blade and used a brad to hold the circles together. Then I cut out a few leaves from some pretty, green felt and sewed a straight stitch through the middle of each leave with some lighter green DMC floss. All of the other flowers are Prima and I added a small rhinestone to the center of each. I also rubbed the lace with some brown ink, to antique it up a bit. I had a lot of fun doing this challenge and I hope to work on another one soon! Maybe a card will be next! Beautiful layout! I love it!!! The colors, the flowers and jewels... Specially the photo!! :) Love it!!! Gorgeous! Love all the brads. and the flowers are beautiful!! absolute perfection. Love the colors and lace and fabric flower! Oh hey, I just love it all. Great details make this one a winner. Thanks for joining us at practical scrappers. Love it! Those rolled edges are just perfect on here. 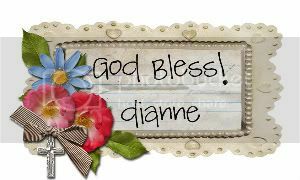 Dianne, this is so beautiful. Thanks for following me so I could see your creativity! Pass It on Card Ministry - First Give Away!